Watching this long form commercial for the Nokia N900 brings back less than fond memories of agency concepting sessions during which creative types (and everyone else for that matter) would begin to act like idiots, spout out idiotic buzz words and, in some cases, even burst into full blown freak outs like one dude does here. It's endearing to know this spastic behavior still exists in the industry. And if this commercial is trying to deliver some deeper message, it's surely escaped us. And we're the best test for this sort of thing. Because if you can't connect with our simple mind, there's no way you're going to connect with the people you'd like to buy your phone. You've always got to wonder about these ads. You know the ones. The entire ad is one large graphic. And the only other thing on the page is a tiny logo and, perhaps, a tagline. And it's in English but from non-English speaking country. Nine times out of ten, they are spec or spoof ads. And sometimes they can cause you to be sued for thousands by brands without a sense of humor. 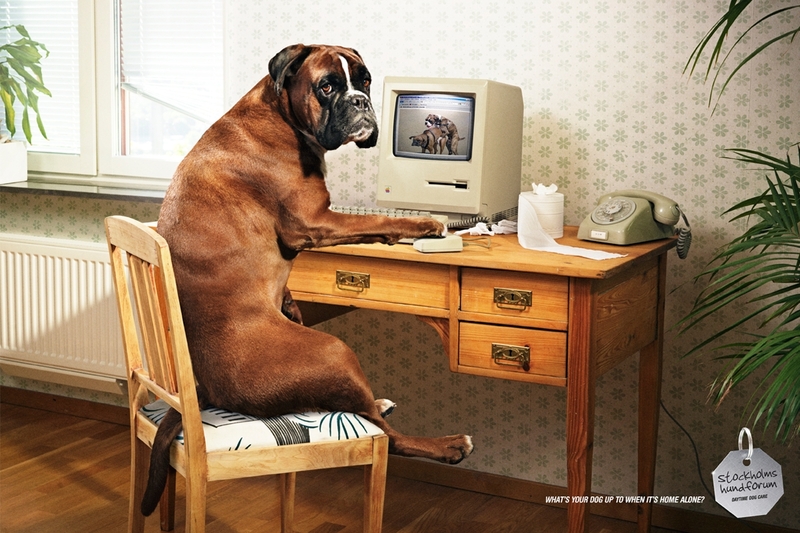 This ad for a daytime dog care company asks us to wonder just what our four legged friends really do all day long when they're home alone. According to this ad, they are no different that us humans when we get a little bored and need a bit of distraction from the stress of our daily routines. We've asked the creators of this ad, Jung von Matt in Stockholm, Sweden, to categorize this ad for us (they've confirmed it to be the deal deal) but we really don't care. We like it whether it's real or not. That's My Billboard! No, It's Mine! No, Mine! Waa! Waa! Pity the poor wild posting. It's under attack by New York-based Public Art Campaign. Specifically, the group is targeting NPA, a company which maintains a collection of specific wild posting locations. Public Art Campaign representatives Sunday were seen around Manhattan with buckets of white paint covering NPA wild posting boards. According to Gothamist, less that an hour after the boards were whitewashed and non-commercial art applied, NPA had reclaimed the boards are reposted them with commercial messaging. It's like two kids fighting over a toy (Mine! Mine! Mine!) until it breaks. Which then leads to a dueling temper tantrum of epic proportion. According to the New York Times, five people were arrested in association with the standoff.